Companies that rely on compressed air systems are constantly looking for ways to make them run more efficiently. Many of these companies end up spending more money than they need to on an annual basis simply because their existing air systems are inefficient and wasting air. One of the many reasons that this can happen is due to something called artificial demand. Essentially, artificial demand is, according to Compressed Air Challenge, “the excess volume of air that is required by unregulated end uses as a result of supplying higher pressure than necessary for applications.” Artificial demand in an air system is something that needs to be considered as part of the overall air system, and it should be monitored to make sure your air system is running properly. In more lay terms, this artificial demand is the extra pressurized air in the system that is not being used or is being generated even though the attached components or end applications are not being used. The higher pressure causes more CFM to flow through orifices, leaks or similar types of openings. This means that the system is always running as though it needs to provide pressurized air throughout the system, even if the actual demand isn’t there. For example, a 20 PSI increase on a ¼ pipe will cause 10 more CFM to flow out the opening. Many compressed air users don’t realize artificial demand exists and therefore don’t know how to reduce its effects. 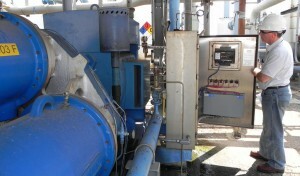 Companies can reduce the artificial demand by implementing an overall controls system to maintain the compressed air system at the actual pressure that is required. This minimizes extra strain on generation units, reduces pressure being held throughout the system unnecessarily, and can decrease utility costs while increasing the lifespan of the system overall. Is your company currently using an air system where the supply and demand are out of whack and not conducting true load sharing? Are you operating your air system at a higher pressure because it is not under control? Case Controls can help you with this problem by offering up real solutions. We can provide you with compressor management equipment that will bring your artificial demand down and see to it that your equipment doesn’t waste any energy or money when it’s running. Whether you want to install AirMaster load sharing solutions for centrifugal compressors or you want us to take a look at your current setup and give you our opinion on your best course of action, we are happy to help you get your facility under control. Call us at 812-422-2422 today and find out how we can help you get the most from your compressed air equipment.